We’re taking a lot of pictures these days. Not just photographers—in all likelihood, photographers are probably taking marginally fewer images than they did a few years ago. I mean, everyone is taking pictures at a rate so as to almost totally disarm whatever value or power they really had to improve the lives of the people taking them. It eventually just becomes… noise. Let me explain—when you take a gazillion photos on your phone, or point and shoot, or whatever—that’s not taking the power or value of photographs and multiplying it a gazillion times. It’s taking the power and value that existed in a handful of important images, and dividing it a gazillion times. Even the most pointed and meaningful images are drained of life as they sift unintelligibly to the bottom of a haystack, becoming the proverbial needle you are unlikely to ever find or use. In the life of a family, having a million photos on your phone is a little like having an encyclopedia you never pull off the shelf—or, perhaps a more timely example, having a Wikipedia bookmark you never click. Access to knowledge is not the same as pursuing knowledge. The same goes for whatever value photos of your family hold. Simply having photos doesn’t really mean anything for your family if you don’t use those photos for something. You actually have to look at the photos, and see them regularly in order for your family to see the fullest benefit from them. That’s a problem for the digital touch-and-go time in which we find ourselves today. Photos aren’t just about nostalgia. In the context of a family, that’s not even their chief power. Regular exposure to images of ourselves and the people we love help us create a self image, they help inform our self-esteem, and they help to knit and solidify our relationships with one another. They help us define a narrative, and even help us imagine the future, which is nebulous and always uncertain. But these are not things that happen when you see a photograph, they are things that happen when you keep seeing the same photograph over a long period of time. Let me try to explain what I mean with a personal example. Today, my sisters and I enjoy a fairly healthy, friendly and close relationship. We’re acutely aware of our history together and there is little intellectually or emotionally that can challenge those bonds. It wasn’t always that way—we all dealt with teenage angst and we’ve had plenty of scuffles, as siblings are wont to do. But when we each subsequently moved from those phases in life, a relative closeness came pretty naturally, and seemingly, all on its own. Now, there are surely many interwoven explanations for this experience—correlation is not the same as causation, after all—but it’s hard for me to believe that the persistence of my father’s photography wasn’t an important factor. There is one photo in particular which hung in various places throughout our home all our lives (and now hangs in my office) which I believe has acted as a kind of glue in our experience as siblings. It’s a photo of the three of us, at ages approximately 5 and up. 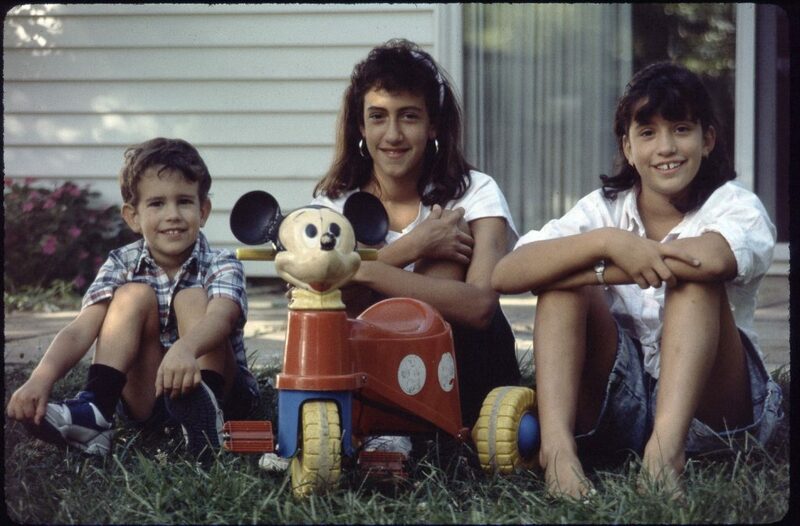 We’re seated with our arms wrapping our knees next to what is now an heirloom toy; a Mickey Mouse tricycle which all three of us had played with at various times in our early childhood. We’re not overly expressive in this photo. We’re not hanging on each other, or goofing or showing off. But, it is authentic. It expresses something about our relationship to each other at the time, it expresses something about our values as a family, and it expresses something about these three kid’s relationship to their father while he’s holding a camera (taking a picture may not have been easy, but he did it and we acquiesced, at least for a split second). I’ve been looking at this picture forever and could analyze it photographically and emotionally all day. I could give you a litany of examples about how this photo describes this or that dynamic, and how it inspired me in this way or that way. It’s a very good photo—especially when considering it comes from the era of film and a set of subjects who rarely sit still. But frankly, it could have been almost any photo of the three of us. The real point here is that I saw that photo every single day. I’ve had at least 27 years to think about that photo and what that photo made me think of the most was my sisters and our childhood. Human beings and relationships are necessarily complicated and rarely crystal clear. You could make a full time job out of trying to understand them. Or… you could put a photo on your wall where you’ll see it every day. This is the point I want to make here. It’s not about hiring a skilled photographer every year. It’s not about taking more photos with your phone or point and shoot. It’s about zeroing in on a few choice photos—from wherever they may come—and inserting them unmistakably into your real life, where they’ll be subconsciously analyzed forever. From wherever the images of your family arise, pick a few, print them out, and leave them where your family will see them every day. Move them around if you must. Add new ones from time to time, but let a few of them become iconic. Let a few of them persist until you are barely even consciously aware of them. When life changes, when families grow, when loss comes, when times become difficult and when peace is found, the images that you have allowed to stand the test of time will be there. They will take on new meanings. They will change, and they will change you. They will keep you on your path, they will knit you to the people you care the most about, they will strengthen the most fundamental bonds, and give you clearer perspectives on the trivialities of conflict. So, as you approach this holiday season with your family, create all the images you want, but make some of them icons in you and your family’s story.